PRP therapy is used in joint problems to reduce pain, improve joint function and delay and even stop the progression of joint degeneration. After a simple blood draw and an advanced extraction technology, a thin needle is used to inject your own Platelet-Rich Plasma (PRP) into the joint or tendon. 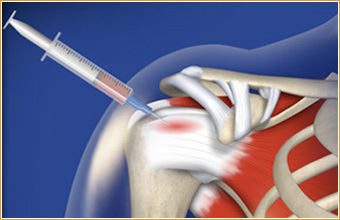 PRP is typically injected into the knee but can also be used in the shoulder or elbow. PRP delivers a high concentration of growth factors to arthritic cartilage or injured tendon which helps repair the tissue, stimulates tissue regeneration and promotes healing. Injection of PRP to the injured tendon provides the tendon tissue with healing growth factors that are otherwise difficult to deliver to the site because of the poor blood supply found in these areas. PRP Joint and Musculoskeletal injections are a state of the art, non surgical, medical procedure used for the treatment of joint pain and tendon degeneration. Dr. Mann uses ultrasound guidance to deliver the PRP to the site of the specific problem. Because this injectable treatment uses the patient’s own blood, there are no risks of allergic reactions. Yes. At Juvenate Medical Wellness and Rejuvenation, we use only the latest PRP leading edge patented technology. Used in conjunction with a patient’s own biological cells it is a means of naturally promoting joint rejuvenation.